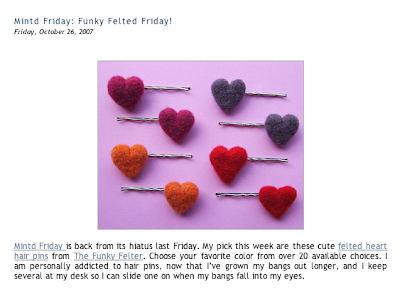 Jen at IndieFixx.com has chosen to feature my little heart hair pins! These are available at both my Mintd shop and my Etsy shop. They are also customizable with 20 colors to choose from. A big thanks to Jen and her most excellent blog Indie Fixx! A little about Indie Fixx, in case you didn't know . . .
"Indie Fixx is a celebration of the creativity, tenacity, and general spunky goodness that is the indie design movement. The indie design movement is made up of artists, crafters and designers who make a literal smorgasbord of delectable indie products. Once you shop indie, you’ll never go back." Now go check it out!